Editorial Board: Prof. Andre Rossi (Utah Valley University - USA), Prof. Clara Luz Alvarez (Universidad Panamericana - MEXICO), Prof. Diego Cardona (Universidad de Rosario - COLOMBIA), Prof. Francisco Sierra Caballero (Universidad de Sevilla - SPAIN), Prof. Fabio Bassan (Universitá degli Studi Roma Tre - ITALIA), Prof. Judith Mariscal (CIDE - MEXICO), Prof. Hernán Galperin (Universidad de San Andrés - ARGENTINA), Prof. João Alberto de Oliveira Lima (Universidade do Legislativo Brasileiro - BRAZIL), Prof. Liliana Ruiz de Alonso (Universidad San Martín de Porres - PERU), Prof. Lucas Sierra (Universidad de Chile - CHILE), Prof. Luís Fernando Ramos Molinaro (Universidade de Brasília - BRAZIL), Prof. Murilo César Ramos (Universidade de Brasília - BRAZIL), Prof. Raul Katz (Columbia University - USA), Prof. Roberto Muñoz (UTFSM - CHILE). e-Copyeditor: Andre Moura Gomes and Marcos Urupa. Periodicity: two annual issues on May and October uninterrupted since May 2009. Submission process: authors are requested to submit their papers through the website of the University of Brasilia Center on Law and Regulation (http://www.ndsr.org/SEER/index.php). The journal adopts the double-blind peer review process. Archiving policy: LOCKSS, DOAJ and Brazil’s Senate Library. Indexation: Scopus (Elsevier); EBSCOhost research databases (EBSCO Publishing Inc.); Gale Group; AE Global Index; OAI (Open Archives Initiative) - DOAJ (Directory of Open Access Journals); WorldCat; Google Scholar; The European Library; CIEPS (Centre International d’Enregistrement des Publications en Série; SEER/IBICT. BOARD, E. Journal Info. 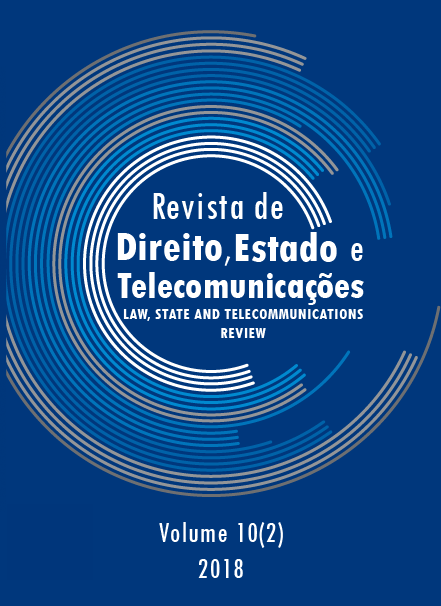 Law, State and Telecommunications Review, v. 10, n. 2, p. 103-104, 15 out. 2018.